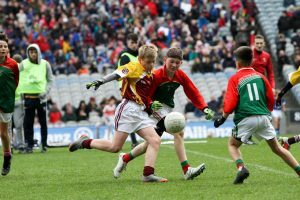 Before we get into the details of what happened in Croke Park, here’s a brief review on the last few months in Holy Family GAA circles! 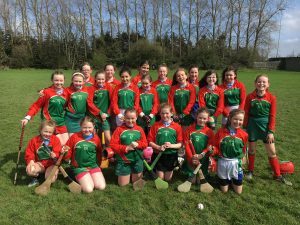 Last October, we were well beaten by Our Lady’s BNS, Ballinteer in the quarter finals of the Corn O’Donnchu in Marlay Park. Out of the team who started in Croke Park, only six started twelve months ago. 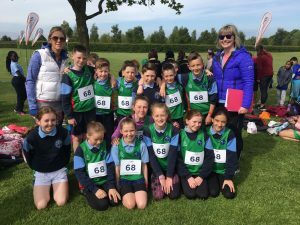 Nearly all of our subs were in 4th or 5th Class so I knew we would have a fairly strong team come September 2018. Due to the fact Cumann na mBunscol in Dublin run off all their football games before Halloween, I wanted to have a fair idea in my mind what sort of panel we would have before the summer holidays. We had some great training sessions in the glorious weather of May and June. The majority of the lads here attended all these sessions despite the fact I could only bring a certain amount to the Four Corners tournament. The standard was improving all the time. We went on to win the Four Corners for the first time since 2013. Like yesterday, the final was a real cliff-hanger but we managed to secure a one point win. I had my mind made up after winning the final that our defence in September was going to be built around Eoin Keane who was outstanding on that June day. 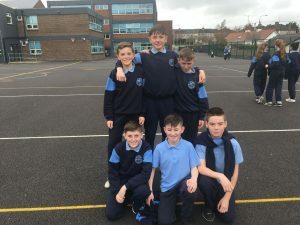 I also knew that the likes of Jack O’Connor, Jack O’Callaghan, Jacob Comiskey, Daniel O’Kelly and Rhys Rankin were going to feature prominently on the team. This September saw Mr Cannon arrive in the school. Initial fears that he had brought Jim McGuinness’ blanket defence with him from the Hills of Donegal were dispelled quickly as we went goal crazy in our opening game of the year, defeating St Pat’s Corduff on a scoreline of 6-5 to 4-2. 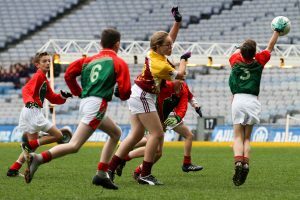 St Pat’s actually went on to win the Shield in Croke Park so congratulations to them. 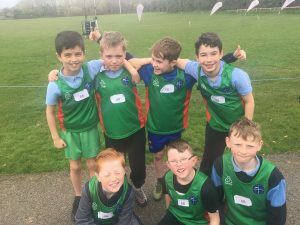 We followed this up with two comprehensive wins over Castleknock Educate Together and St Mary’s Saggart. With three wins out of three, we were now in the quarter finals. As I mentioned earlier, last year’s quarter final was a far from pleasant experience for us so I was hoping this year we could turn things round. To say we did that against Harold’s Cross would be an understatement! 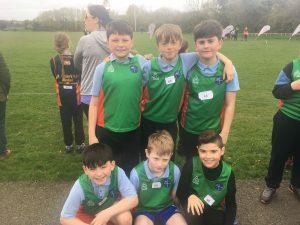 Cian Jordan decided to help himself to 4-0, Conor Quinn gave an exhibition in shooting 1-5, Dean Simpson kicked 1-4, Seán and Rhys got 1-2 each, Shane hit 0-3, Jack O’Callaghan scored a goal from long range, Jacob Comiskey sauntered up the field at his leisure to kick 0-2 and Daniel said “0-1 will do me just fine!“ Poor Ben Noone was devastated to be missing out on all the action! 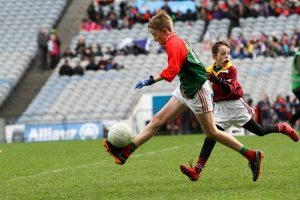 Our semi-final against Gaelscoil na Camóige was a definite step up in quality. The opposition posed us many problems early on but thankfully, Ben, Eoin and Aaron were in, let’s just say, ‘uncompromising mood’. The ever reliable Jacob Comiskey gave an exhibition at centre back while even a big husky dog couldn’t deter Jack O’Callaghan from going for a fifty fifty ball! David Vickers and Seán Reilly did brilliant man-marking jobs on two of their best players while the rest of our team put some beautiful moves together culminating in scores from Conor, Dean, Jack, Cian and Shane with Daniel pulling the strings from midfield. We emerged victorious on a final scoreline of 3-8 to 1-3. We could now officially start looking forward to a day out in Croke Park! 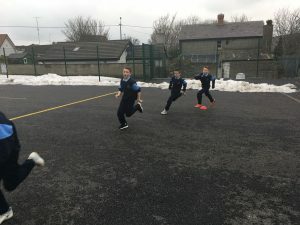 In preparation for the final, we played Scoil Chrónáin in a challenge match in Commercials. All 26 boys on the panel played at least a half in this game. Joe Maloney’s second half hat-trick was one of the highlights of the game! With another win under our belts, the lads were in confident form ahead of the big match in Croker Park. 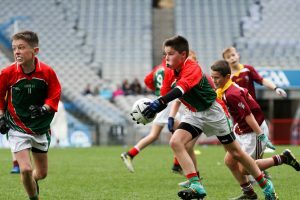 In what had to be one of the most exciting games played in Croke Park in this year’s Cumann na mBunscol finals, it was the lion-hearted boys from Holy Family that emerged victorious after a titanic struggle with Sacred Heart NS, Sruleen. Even when the referee eventually called a halt to proceedings, not many were sure of the actual result. Both teams surrounded the referee waiting anxiously to hear the final score. Queue unbridled joy from the boys in green and red! 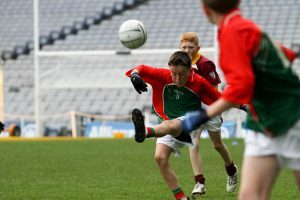 This was a final worthy of the hallowed turf of Croke Park. Wonderful goals, top-class points, precise passing and inspirational blocks were only some of the features of an extraordinary match that ebbed and flowed the whole way through. 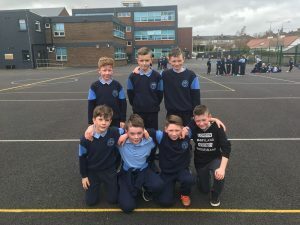 Sacred Heart were quicker out of the blocks as their star man (Jack McCabe) scored a cracking goal from twenty yards before adding a close range free. However, it wasn’t long before our lads started to motor and Rhys Rankin’s daisy cutter rattled the back of the net much to the joy of the vociferous Holy Family support in the Hogan Stand. Excellent points from Conor Quinn, Dean Simpson and Daniel O’Kelly settled us further but just as we were getting on top, Sacred Heart struck for their second goal. This was followed by two pointed frees and again we were playing catch up. Jack O’Connor was quick to make sure we weren’t in their rear view mirrors for long though with a brilliant goal and point in a blistering five minute spell. The outstanding Jacob Comiskey added to our points tally with a beauty off his left. As half-time approached, the sides were level at 2-6 apiece but a fortuitous goal from Dean Simpson gave us a three point interval lead. Looking back on the game, our flying start to the second half paved the way for victory. Two goals in quick succession from Conor Quinn and Jack O’Connor gave us a lead we never relinquished thereafter. To their credit though, Sacred Heart kept battling away and the result was in doubt literally until the final whistle. Seán Reilly’s goal line block in the last minute turned out to be a match winner. Was it a relaxing second half so? You must be joking! It definitely wasn’t from a lack of effort that Sacred Heart didn’t overtake us on the scoreboard. Their players gave it everything and can be proud of their effort but on the day they came up against an extremely determined bunch of lads who just left everything on the field. Adam Long was intelligent with his kickouts as he went short when he had a free man and went for distance if there was any doubt. 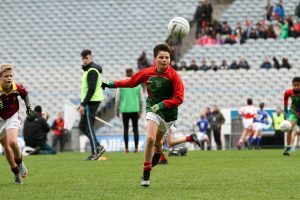 Captain for the day, Eoin Keane thwarted many an attack while he was ably assisted by his corner backs, Ben Noone and Aaron McCusker, two lads who thrive on tackling and blocking! Jack O’Callaghan and David Vickers intercepted a mountain of ball while the mighty Jacob Comiskey was a contender for Man of the Match. 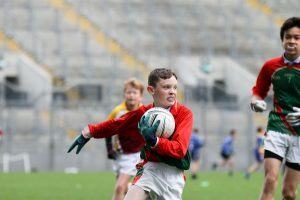 Daniel O’Kelly and Seán Reilly worked tirelessly throughout, switching markers as the game progressed. Along with Dean Simpson and Jacob, they communicated brilliantly in their bid to counteract the gifted Jack McCabe. Dean is a class act and the venue definitely didn’t overawe him today. He kicked some great scores at crucial times. Conor Quinn is one of our most talented players and showcased his undoubted talents again today, kicking 1-3 in the process. Jack O’Connor had a scintillating first half and a solid second half. He has been brilliant this year. Rhys Rankin at full forward saved his best game of the year until last. He won nearly every ball that came his way and was a constant thorn in the side of the opposition. Shane Manscier had a quieter day today than usual but he contributed handsomely on our road to the final. Cian Jordan didn’t manage to get on the scoresheet either today but he caused the full back line all sorts of problems with his lively movement. Introduced at half time to make an impact, Jake Tansey certainly didn’t let us down, scoring 1-1 and winning plenty of ball. Alex Baxter was unlucky not to start but played an important role in helping us see out the game. To those who didn’t get to play today; Joe Maloney, Seán Mattison, Tony Ashby, James Bennetti, Andrew Millar, Brandon Byrne, Charlie Boggins, Travis Moore and Evin Sebastian, it really was a team effort throughout. All of these boys played their part in the five games we won to reach the final. Overall, it was a day that will live long in the memories of all of us who were lucky enough to be in Croke Park. Well done to a fantastic group of boys on a wonderful achievement. They really got what they deserved. It’s a pleasure to be involved with them! Holy Family abu! Team: Adam Long; Ben Noone, Eoin Keane, Aaron McCusker; Jack O’Callaghan, Jacob Comiskey (0-1), David Vickers; Seán Reilly, Daniel O’Kelly (0-1); Conor Quinn (1-3), Dean Simpson (1-3), Jack O’Connor (2-1); Shane Manscier, Rhys Rankin (1-1), Cian Jordan. Subs: Jake Tansey (1-1), Alex Baxter, Tony Ashby, Seán Mattison, Joe Maloney, Andrew Millar, James Bennetti, Brandon Byrne, Charlie Boggins, Travis Moore, Evin Sebastian. Meet the Holy Family Panel! Adam Long – No one wanted to play in goal at the start of the year. This fella told me after our first game he plays in goal for his soccer team. An excellent shot-stopper throughout and intelligent kickouts in the final were a feature of his play. Ben Noone – Every team needs a messer. Ours plays corner back! A teak tough defender, Ben blocked and tackled like his life depended on it. 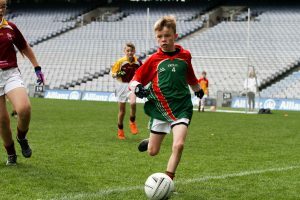 Eoin Keane – Captained our team in Croke Park. Mr Consistent didn’t put a foot wrong all year. Brilliant attitude. This man is going places. Aaron McCusker – A lovely lad in general but every corner forward’s worst nightmare! It’s not the size of the dog in the fight; but the size of the fight in the dog. Aaron, I’m not calling you a dog but by God, you’re well able to fight for that ball! Jack O’Callaghan– This man volunteered to go in goal in our first game this year. The ultimate team player. Possibly our tightest marker, did brilliantly on short kickouts in the final. 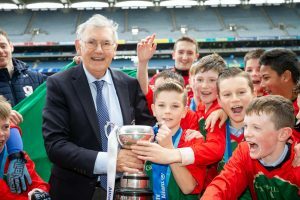 Jacob Comiskey – A lot of our younger generation here might never have heard of legendary Cork hurler, Diarmuid O’Sullivan. His nickname was the Rock. Well we have our very own Rock of Rathcoole here. With a wand of a left boot, I think we’re going to hear a lot more about this man in years to come. David Vickers – Possibly the most improved footballer in the school this year. Won’t be on Mr Referee from Croke Park’s Christmas card list this year but David we think you did brilliant. Seán Reilly – Would we be here at all if this man hadn’t intervened when the net in Croker was ready to bulge? Another consistently good performer who got better and better with every game. Daniel O’Kelly – Probably sees more ball than any other player in a match. Tireless worker, so unselfish and no shortage of skill. A real leader and example to everyone in the school. 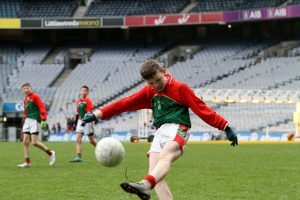 Conor Quinn – He can score goals. He can score points. He can kick with the right. He can kick with the left. There are very few things this man can’t do with a football. I’ve heard rumours that he prefers soccer. An outstanding talent. Dean Simpson – The playmaker and free taker. This fella eats, drinks and sleeps GAA. Like Conor, it doesn’t matter if it’s left or right, it’s going between the posts or under the bar. Any manager’s dream. Jack O’Connor – The only Thomas Davis player on our team. An example that St Mary’s and Thomas Davis players can get along just fine. Try telling that to the lads on Saturday! Jack really came to life in our last two games. With an eye for goal, Jack caused huge problems for opposing defences. Shane Manscier – The USA have Donald Trump. In Ireland, it looks like we’ll have Michael D for another 7 years. In Holy Family, we have Shane! An exemplary sportsman, his ball handling, and ability to bring others into the game are Shane’s strongest features. One of the most unselfish players on the team. Rhys Rankin – The right foot may be for standing on, but the left one is lethal. Rhys gave the large Holy Family contingent reason to shout when he rattled the net at the Davin Stand End on Tuesday. A great ball winner. Cian Jordan – Many a time I played in the full back line over the years. Safe to say, I’m glad this fella wasn’t around. Scored goals for fun all year, he was inches from adding to his tally on Tuesday. They don’t come much trickier than Cian! Tony Ashby – Was unfortunate that Ben and Aaron have been in such good form of late. One of the real characters on our team with no shortage of football ability. Joe Maloney- Since our win on Tuesday, rumours have been circulating that Hill 16 is no longer Dublin only. It’s now known as Hill 16 is Joe Maloney! Has got better and better over the last two months. Really unlucky not to play in the final. 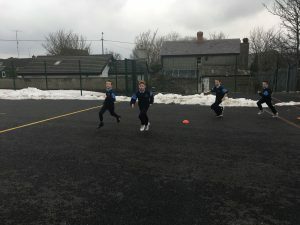 His hat trick against Scoil Chrónáin was one of the highlights of the year. 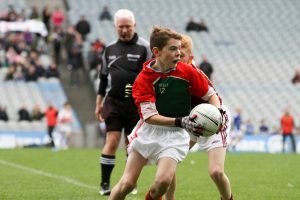 Seán Mattison – Like Joe, this fella was very unlucky not to play in the final. If he continues to develop at the rate at which he is, a bright future in the St Mary’s colours await. Alex Baxter – This man was brought on in the final when David was threatened with a red card. He most certainly didn’t let us down. A fearless competitor, Alex excelled in every game he played this year. He even played in goal when Adam was sick! Jake Tansey – Could have easily started but we held him in reserve for a reason -to make an impact. And he sure delivered. Is Gaelic football his favourite sport? I’m not sure. He should consider playing more often! Andrew Millar – As dedicated as they come, this man never misses a training session. Featured in most games. A tight marker with a great attitude. James Bennetti – Like Jack O’Connor, this man is in the minority in that he doesn’t play with St Mary’s. 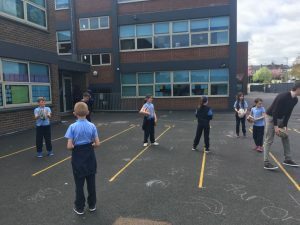 A Round Towers player who provided plenty of inside info on Gaelscoil na Camóige. A solid defender. Charlie Boggans – Another character in our panel. Charlie did well whenever he was called upon. Improving all the time. Brandon Byrne – Performed well in training and tried really hard during the games. That left foot is coming along nicely! Travis Moore – Scored a great point against St Mary’s Saggart as he was falling over. Rarely seen without a smile on his face, I think he really enjoyed being involved. Evin Sebastian – Has a terrific attitude. 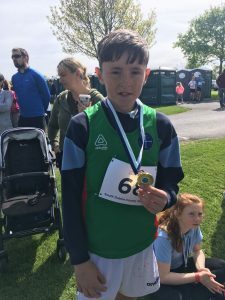 A very determined and dedicated player, his best performance of the year came in defence against Scoil Chrónáin. It would be remiss of me not to acknowledge the many people who helped out in making this journey a successful and enjoyable one. Firstly, I want to thank Mr Cannon. I assure you this was a team effort. Being the modest man that he is, a lot of you probably don’t know that he has represented Donegal at all grades. He is very knowledgeable and added greatly to the set up this year. Who would have thought a Mayo man, a Donegal man and a crowd of Dubs would work so well together! Secondly, I want to thank Mr Byrne, Mr Gavin and all the staff here in Holy Family. Without the support of the staff, it wouldn’t be possible to play these games. 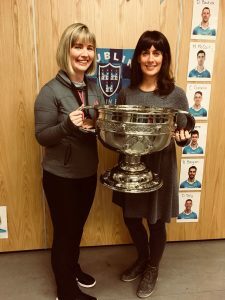 Special thanks to Ms O’Donovan and Ms Dempsey for covering my class, enabling me to go to all the games and to Ms Haran who covered for Mr Cannon. 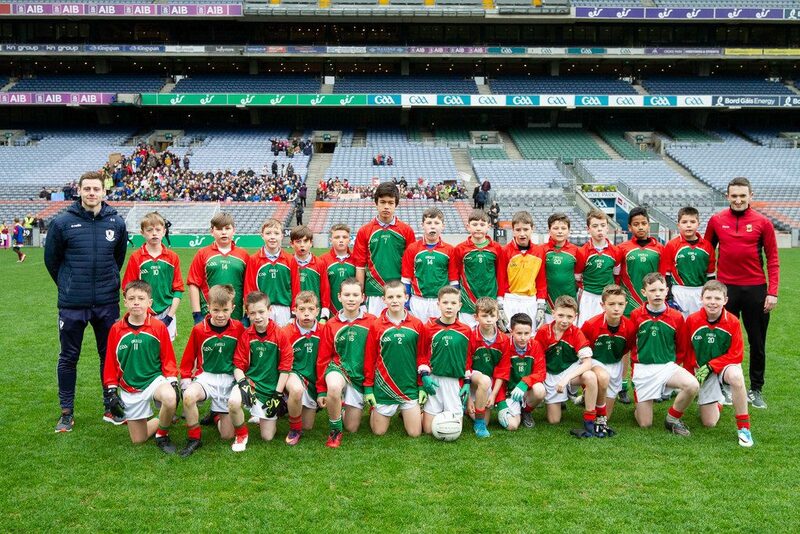 A huge thanks also to our band of supporters from 4th, 5th and 6th Class who along with their teachers and SNA’s created a wonderful atmosphere in Croker and literally roared us over the line. The help and support we have received from parents is genuinely appreciated. Special thanks to all those who helped with lifts week in, week out. Thanks a million to John Simpson who made St Mary’s GAA, Saggart available to us any time we needed it and what about Cathal Comiskey who performed the proverbial blinder on the day of the final?! Photographer and match recorder extraordinaire. He even gave my Dad a lift back to the airport after the match! 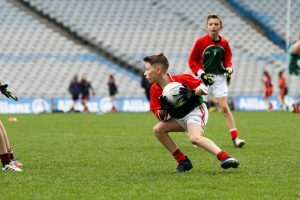 Every young boy and girl who loves GAA dreams of playing in Croke Park. The next best thing is being on the sideline. Because of these lads, I got that opportunity. If we had lost after the way we played, I would have been devastated for them but just as proud. Winning was a bonus. It really is a pleasure to be involved with such a lovely bunch of talented footballers with the right attitude. 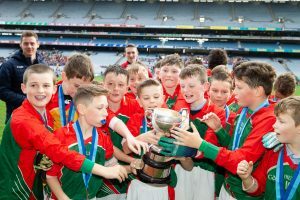 16 years ago when I was in 6th Class, we won our own Cumann na mBunscol Final in McHale Park, Castlebar. I still have great memories of that day. Everyone associated with this team should treasure what happened in Croke Park on October 23rd 2018 for years to come. I know I will! 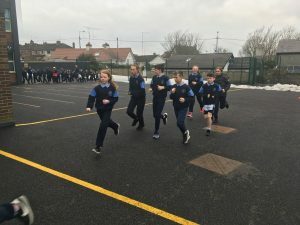 We had a very successful cross country season with 65 children from 3rd class to 6th class on our team. 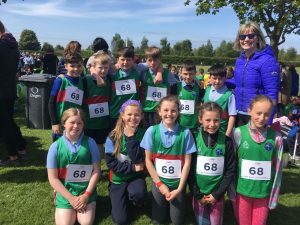 We had three league races in Griffeen park in Lucan in February, March and April and a finals day in Corkagh park in Condalkin in May. 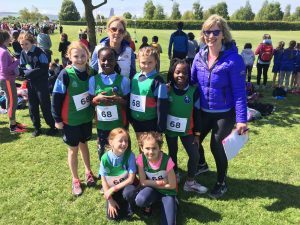 78 schools with 5000 children from South Dublin competed in the finals. 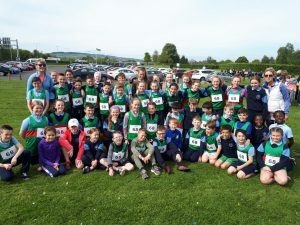 Fantastic day yesterday at the Cross Country Finals in Corkagh park. Three children got to compete in the Champions Race as they came 1st in the previous league. Every competitor got a medal for all their training and competing over the past 5 and a half months. Well done to all the children. They did us proud! Each came to training and fought hard for their place on the team. Each encouraged and cheered each other on. They wore our school colours with pride. 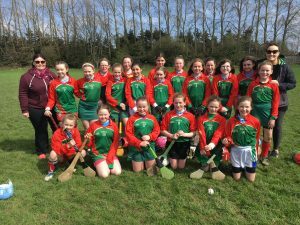 Hard luck to the camogie girls yesterday who were defeated in the Quarter Final of the Cup. 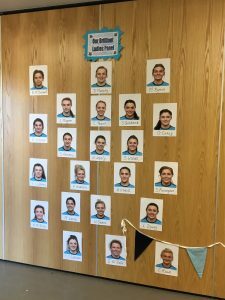 We are so proud of their fight, spirit and excellent attitude shown throughout all the matches and yesterday was no different. 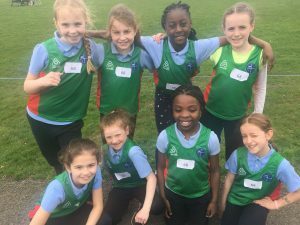 A brilliant fight to the finish – Well done girls! The boys have the Semi Final of the Cup next week – team and location to be decided. 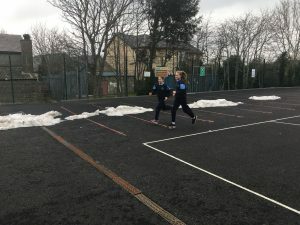 Our hurling and camogie season had a bit of a delayed start due to the weather. Both teams had matches postponed because of pitches being unplayable. Thank you to all the boys, girls and their parents for being patient with last minute changes. Hopefully the better weather will stick around for a while. Both teams have had a fantastic start, winning their first matches with great results. 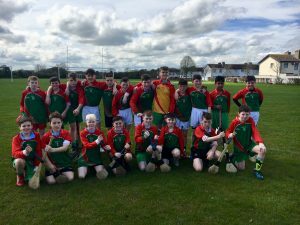 The hurlers beat St Marys, Saggart and the camogie girls beat St Finians, Newcastle. Great teamwork and skill were shown in both matches which was reflected in the winning results. Most importantly, all players showed excellent attitude and sportsmanship. Well done to both teams and let’s hope our success continues. Both teams have made it out of their groups and into the cups. We are very hopeful for success. 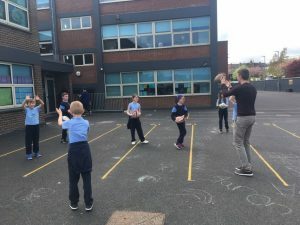 The pupils and staff of Holy Family N.S Rathcoole are working hard together in order to become an Active School. Please take a look below at some of the activities we have been taking part in as we strive to become an Active School. To kick-start the school year actively we introduced 10@10 where the children have 10 minutes of activity in their classroom every morning. 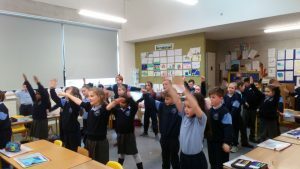 The children love it and it is really helping them to wake up and be more focused for the day. Active lines at small break were also introduced by the Active committee members. 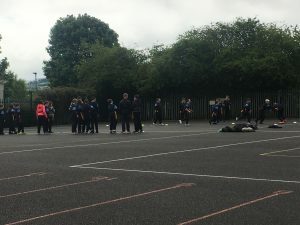 The committee members lead classes in a number of different exercises on the line while waiting to be collected from teachers. Our Active Flag committee members are taking a break from leading the active lines and have become ‘fitness police’. This involves them patrolling the yard in high-visibility jackets encouraging their classmates who are sitting/standing to move around the yard during break time. 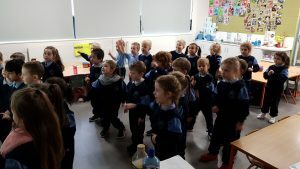 Committee members in 5th and 6th class have also been assigned the job of storeroom checkers for the last 5 minutes of each day based on a rota. They make sure the P.E storeroom is in order and every item is in its right place for classes the following day. 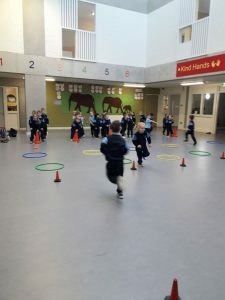 We are continuing our 10@10 in the classroom every morning and introducing active lesson transitions (e.g. 30 jumping jacks) for better focus/concentration during the day. 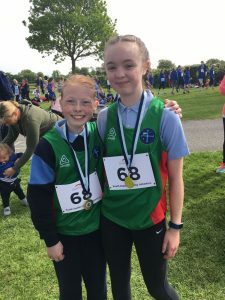 Children are invited to bring in any awards earned in outside clubs and have their photograph taken to be displayed on the Active Flag noticeboard in the school. Their achievements will also be announced at the monthly assembly by Mr Gavin. 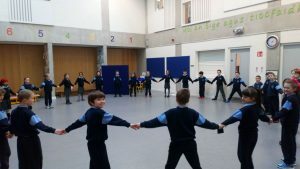 Our fitness police are taking a break from their lunchtime duties as we are introducing dance in the hall at lunchtime one day a week for second class to sixth class. 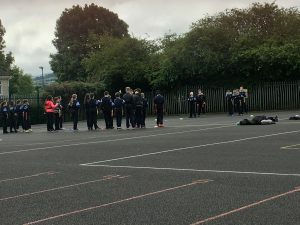 Alongside our active lesson transitions in class Mr Byrne is going to play a song randomly over the intercom a couple of times a week for the coming months to get classes to get out of their seats and drop everything and dance (DEAD). Parents are also invited to join us in a 10 minute walk every Wednesday morning at 9.15 (WOW) around Forest Hills weather permitting. 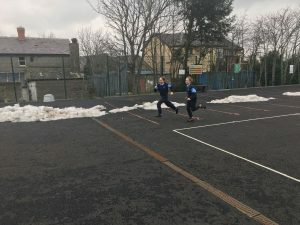 With the new year beginning we are looking for suggestions on how to make the school an even more active place during the day. Committee members have been asked to collect 3 suggestions for the suggestions box on the active board from their class. Committee members will also carry out a ‘What club are you in?’ survey with their classmates. 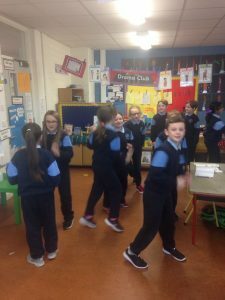 10@10, WOW, dance in the hall at lunch time and DEAD will continue for the foreseeable weeks as they have been very successful in contributing to the children’s activity. 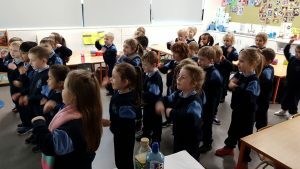 Operation Transformation on RTE1 has launched 3 weeks of new daily 10@10 videos for schools to partake in every morning in class. These are really worthwhile and the children love doing them. Classes are also taking part in a poster competition to promote activity in the school. Each class’s winning poster will be displayed in the P.E hall for the rest of the year. 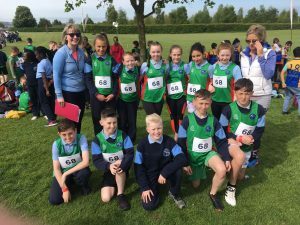 Cross country trials are taking place in Rathcoole Park for our runners this month. 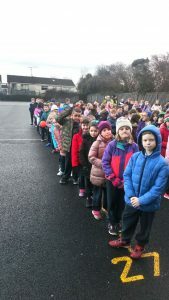 All children from Third to Sixth will walk to the park and are encouraged to take part in the trials for the exercise. 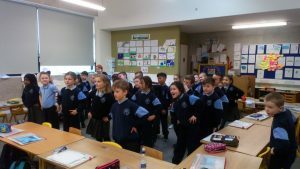 To link in with St. Patrick’s Day and Seachtain na Gaeilge classes are encouraged to do the Operation Transformation lesson transitions in Irish for the month. 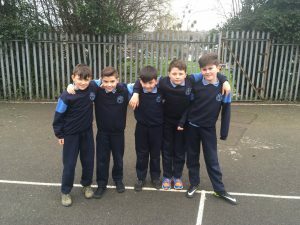 Mr Gavin is setting up a basketball tournament in the hall for 6th class during lunchtime and Mr Commins is setting up a soccer tournament for 4th class on the grass area in Forest Hills during lunchtime, where all children will be encouraged and welcome to take part. DEAD and WOW will continue. A slogan competition will take place too. 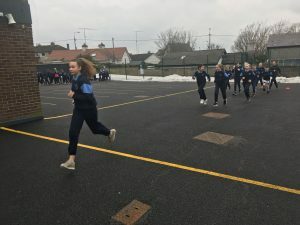 Now that the weather is improving extra yard time and astro-turf slots are being rewarded to classes highlighting ‘No sweets as treats’ to all. Our Active committee are also delivering the message of the winning slogan competition to classes ‘Being Active is Cool, especially at School’. Smile For a Mile will also start this month, whereby children will run for 5 minutes as a class weekly. 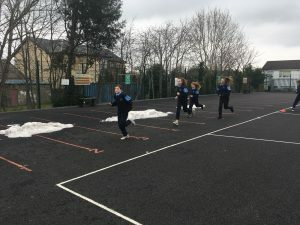 A 126m perimeter was measured on the senior yard and children will record the number of laps ran in 5 minutes (on average) each week on the Active Board. 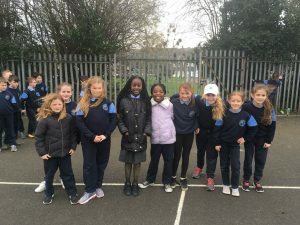 The girl’s vision of playing in Croke Park sadly ended yesterday on Monastery Road. 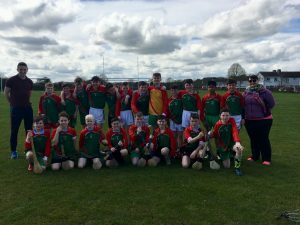 Having already had well earned victories over St. Finians New Castle and St. Mary’s Sagart and being marginally beaten by Scoil Chronain in the last group game we were still given a chance in the quarter final of the cup. 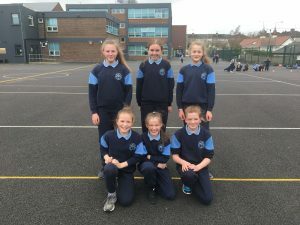 The girls were up against a tall, strong side from Our Lady Queen of Apostles Clonburris and up until the last 5 minutes when a soft goal snuck into the corner of their net it could have went either way. Despite very wet and windy conditions it was a fast-moving and exciting game from start to finish. Clonburris got an early goal to lead but we came back with some cracking scores from Saoirse Murphy, Susie Cronin and Anna Magliozzi. At half time the sides were level and Saoirse got another key point which had us in the lead for the majority of the second half. The backs had a tough job throughout the match with Hannah Byrne particularly showing great bravery. Unfortunately when Clonburris’s third goal came to put them ahead they built on this and got another goal soon after leaving the scoreline at 4-1 to 1-5. The girls were devastated but did themselves and the school very proud. Well done to the team for their fantastic attitude, effort and enthusiasm throughout the season. Our local GAA man, Peter Elliott, from Commercials GAA club has been taking the junior classes for sessions in both gaelic football and hurling since the start of the year. 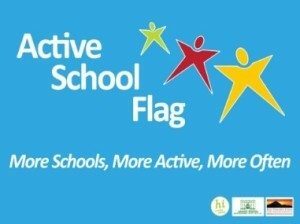 This is a great opportunity for children to learn new and develop skills in these sports and get them active during the school day. 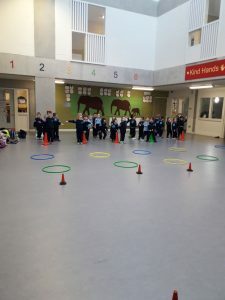 5th Class participated in cycling safety workshops during term 1. This gave them excellent life skills for cycling on the roads which they can carry through to adulthood. This has also encouraged more children to cycle to school. 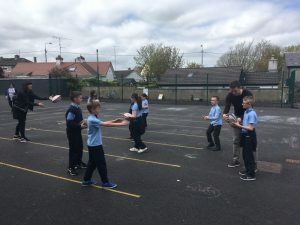 We have recently arranged for a coach from Leinster Rugby to take 5th and 6th classes for a 4 week block of tag rugby. 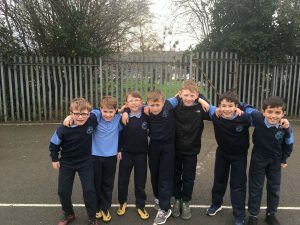 The boys football team have had mixed fortunes on the playing fields this past week. 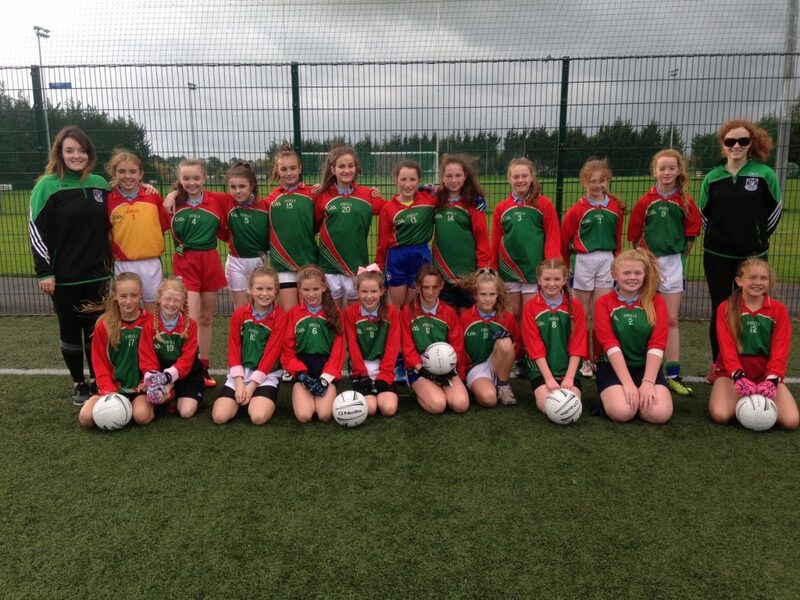 On Thursday 21st September, they lost a cracking game against Sacred Heart NS, Sruleen on a scoreline of 3-11 to 3-9. The teams were very evenly matched throughout. Sacred Heart led at half time by 3-6 to 3-3 with Holy Family’s goals coming from Lee McConnell, Dean Simpson and Jacob Comiskey. It was score for score in the second half but unfortunately, we just came up short despite a great effort. Team v Sacred Heart: Kyle Maguire; Jamie Moore, Aaron McCusker, Tony Ashby; Kyle Humphries, Ben Ratcliffe, James Dignam (0-1); Lee McConnell (1-3), Conor Quinn (0-1); Dean Simpson (1-2), Cillian Byrne, Jacob Comiskey (1-0); Daniel Kelty (0-1), Shane Manscier, Eoin Keane. Subs: Lee Campbell, Seán Craig, Cormac Dixon, David Idemudia, Seán Mattison, Andrew Millar, Evan. 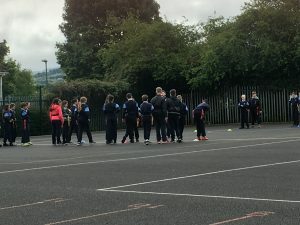 On Thursday 28th September, we got back to winning ways after a good win over St Patrick’s, Corduff. The old adage that ‘goals win games’ was evident in this game as Holy Family emerged as 7-1 to 2-5 winners. In a keenly contested first half where we struggled for long periods, goals from Dean Simpson, Rhys Bankin and Lee McConnell gave us a two point interval lead. The lads put some lovely moves together in the second half and further goals from Lee McConnell, Rhys Bankin, Daniel O’Kelly and Lee Campbell meant we were travelling back to Rathcoole in high spirits! The backs played especially well in the second half with great performances from Ben Ratcliffe, Jacob Comiskey, Adam Coughlan and Alex Baxter. All 30 lads that were togged got to play a part. We are now through to the quarter finals which are scheduled to be played on the 11th/12th October. Well done to all! Liam Goodwin; Cormac Dixon, Ben Ratcliffe, Aaron McCusker; Kyle Humphries, Conor Quinn, Jacob Comiskey; Daniel O’Kelly (1-0), Lee McConnell (2-0); Seán Reilly, Dean Simpson (1-0), James Dignam; Seán Craig, Rhys Bankin (2-0), Aaron Brereton. Subs used: Kyle Maguire, Jamie Moore, Ben Noone, Alex Baxter, Adam Coughlan, Cillian Byrne, Jack O’Callaghan, Zach O’Reilly, Lee Campbell (1-1), David Vickers, Travis Moore, Jack O’Connor, Daniel Kelty, Tony Ashby and Eoin Keane. 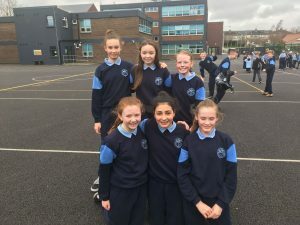 The girls football team had their second great victory recently against St. Mary’s Saggart 8-4 to 0-2 in miserable conditions. They also won against Newcastle by 2 points in a tight game. 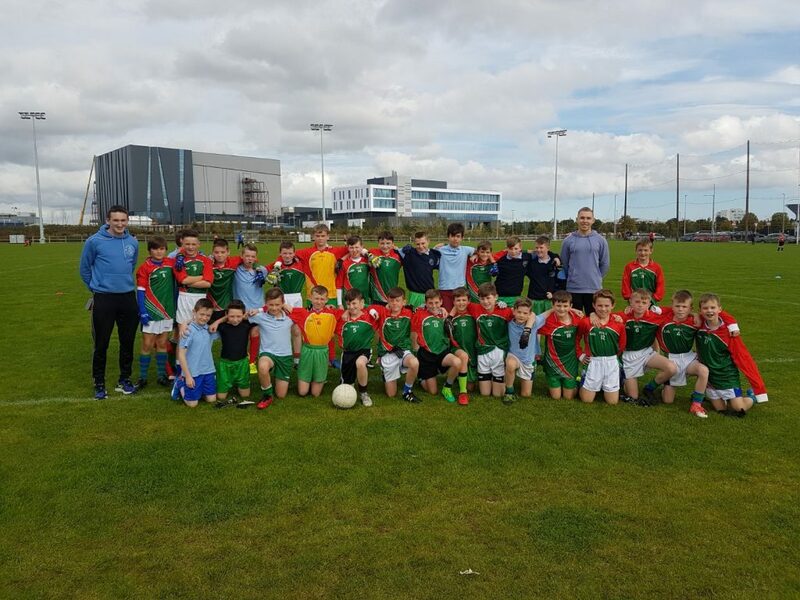 We hope to continue the winning streak next against Scoil Chronáin and be one step closer to Croke Park. The boys football team got off to a great start to the year, defeating St Mary’s Saggart on a score line of 5-4 to 1-0. Congrats to James Dignam who has been chosen as the team captain for the year. 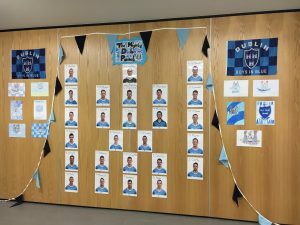 Dublin in the All Ireland! 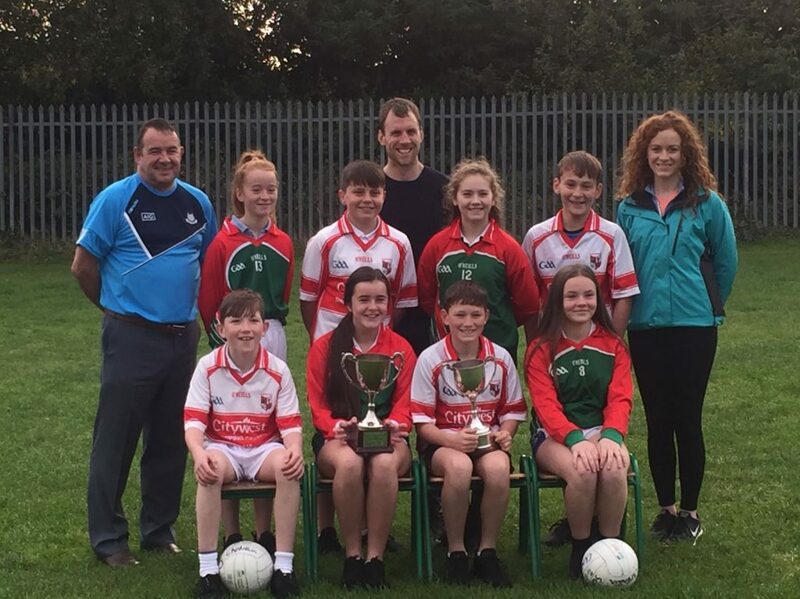 Well done to both the ladies and men gaelic football teams who were both victorious in the All Ireland this year. It was a fantastic three in a row for the men. 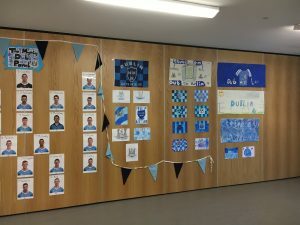 We decorated our school in the hope of victory and it worked! 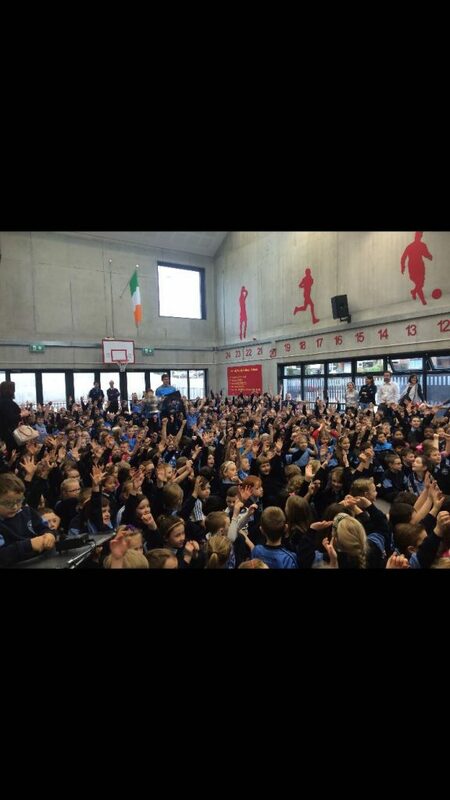 We were lucky to have the Sam Maguire brought into the school for the boys and girls to see. 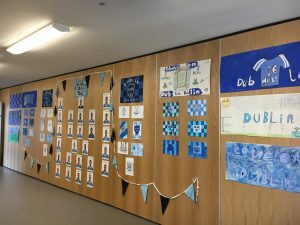 We may even have some Dublin players of the future amongst us.